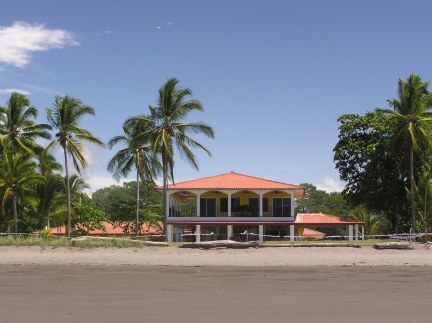 Panama, Las Lajas Beach Resort. Chiriqui as a tourist destination just keeps getting better. The February 2009 opening of Las Lajas Beach Resort should put this province at the top of the Panama tourist list – the trick for us Chiricanos, is getting the public aware of what we have to offer. Found under two hours from Volcan and hours from Boquete. Head east from David for an hour and then turn south when you see the Las Lajas signs. After a 10 kilometer drive on a newly asphalted road you reach a “T” junction at the ocean, then turn right and you will see the resort a short distance away. 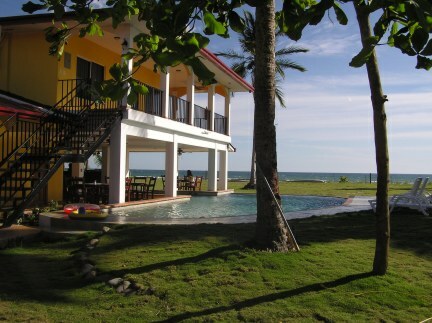 The beauty of this beachfront hotel is that it is not huge – just a comfy, cozy 12 beach front rooms. Owners, Scot Arnold and Peter McNamee have wisely employed a young Dutch woman to be the manager. Lize van den Berg, ads those all-important Dutch-touches – small flower decorations and towels artfully crafted into elegant swans. The air-conditioned rooms have hot water showers and are kept spotlessly clean. As you enter the hotel in front of you are the swimming and soaking pools and just a few yards further over a grass lawn you see and hear the surf of the Pacific Ocean. The bar and restaurant are open to the cooling sea breezes and wonder of wonders a friendly dog will sidle up for a welcoming pat. “Penka” is a rescued street dog that owners have taken under their wing. People who help animals are a special breed and are all right in my book. As my wife and I relaxed by the pool the other resident animal –the house cat came up and leaped onto my lap. With my two, newly found animal friends by my side, the sun on my face and a breeze blowing through my hair, this I felt was about as perfect a place to relax as I can imagine. Light and affordable, is the idea behind the menu items. Breakfast, starts at $3.50 and lunch is $5.50. Evening meals run up to $9.00. Besides the ocean side pool there will soon be horse riding tours of a nearby ranch and trips to see the picturesque town of San Felix and wonder at the rock carvings of ancient petroglyphs. Talking to Manager Lize she said there was some debate about having televisions in the rooms. The owners have said no debate, there will be televisions as soon as they can work out the SKY hook-up. If you are one of those who simply can’t stop working, bring your laptop - the hotel offers wireless internet. 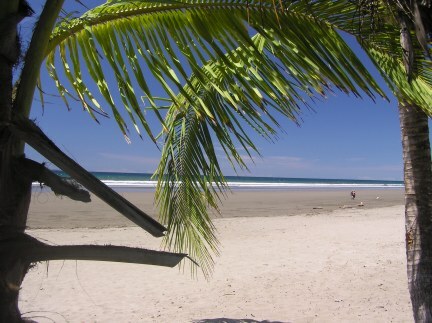 The seven mile long beach is wide and flat and swaying palm trees dance around in a deep blue sky as they frame the outlines of the nearby Secas and Coiba Islands. Fortunately the lots surrounding the hotel have no construction on them, this gives you just the right amount of isolation and serenity for your weekend getaway. Room rates for Monday through Thursday are on special at $75 per night for a couple (+10% room tax) Weekend rates are higher and are normally fully booked and weekdays are running close to 80% occupancy, so reservations are definitely recommended. Come for a relaxing few days away from it all, but if you don’t mind, no smokers, pets or coolers. Call English/Dutch/Spanish Speaking Lize van den Berg for availability.